Heat ghee (or) butter in a pan and add cashews,raisins and almonds. Put it in low flame and fry for few seconds and add semolina to it. Roast sooji in low flame until it becomes light brown colour. Stir sooji continously to avoid lumps which will take five minutes. Now, add sugar to roasted semolina and add water immediately to it. This continous action will help to avoid lumps. Put it in high flame and stir until required (Upma) consistency. Now, add food colour dissolved in water to halwa which is optional. Its time to add sugar if extra sweet is required. Add pinch of salt and put it in low flame and cover with lid. Remove from heat when water is absorbed well. Now, Rava kesari is ready to serve. This South Indian Recipe can be served as sweet with the South Indian Thali. This yummy Rava Kesari can also be served for occasional festivals. 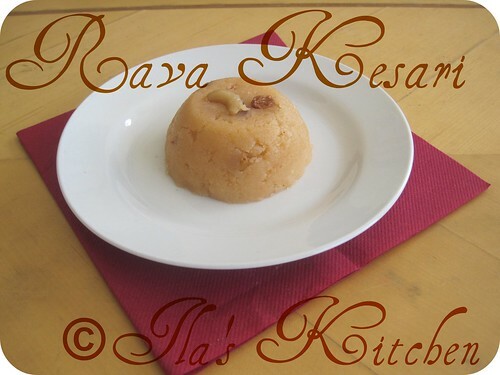 Easy to stir up and delicious rava kesari. Sooji halwa is always my favotire breakfast item ..Looks yummy. my husband's fav. 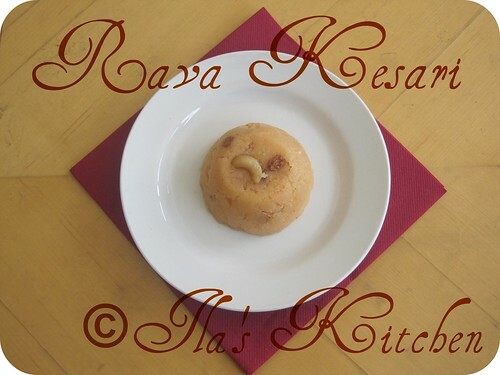 its the simplest sweet that we can ever make..
Soft, fudgy & delicious rava kesari!! Fabulous looking dessert, beautiful presentation! That looks delicious. I'm totally craving it. First time here..u hv a lovely space..happy to follow you..
Halwa is my hubby's favorite and this looks great and delicious!! OMG.. my fav kesari.. mouth watering here.. Gr8 preparation dear ! !